2018 Update: What a pleasure to see all the testimonies on this page, of how praying for the intercession of St Joseph of Cupertino has brought successful exam outcomes. Keep the comments coming! Ora Pro Nobis S. Josephi di Cupertino! St Joseph of Cupertino is the last Saint you would expect to pray for success in even the simplest of exams. He was never known to be the sharpest knife in the draw. So Then, Why Should We Pray to St Joseph of Cupertino For Help With Exams? St Joseph of Cupertino was what people used to call “slow” before the era of political correctness. Early on in his life, he was anything but a success. “He was absent-minded, he was awkward, he was nervous; a sudden noise, such as the ringing of a church-bell, would make him drop his schoolbooks on the floor. He would sit with his companions after school-hours, and try to talk like them, but every time his conversation would break down; he could not tell a story to the end, no matter how he tried. His very sentences would stop in the middle because he could not find the right words. Altogether, even for those who pitied him, and wished to be kind to him, Joseph was something of a trial.” Source: EWTN. No one wanted to be his friend. Even his mom was ashamed of him and gave him lots of grief. 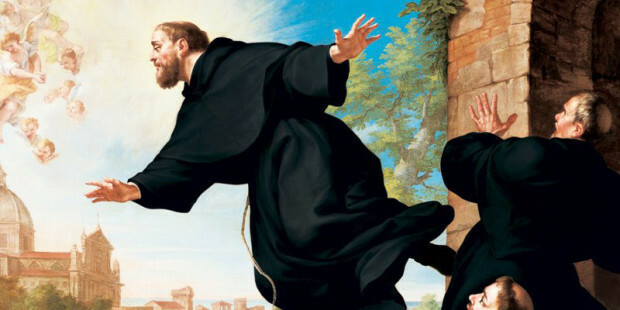 One day something happened that changed St Joseph of Cupertino’s life. A friar came into the village begging for bread. St Joseph thought to himself, ” I might be horrible at everything, but surely I am good at begging for bread”. And thus his journey began with the Franciscan Friars. Even after being admitted to the Order, St Joseph of Cupertino had a difficult time. However, despite his mental shortcomings, and constant ribbing and abuse from his fellow friars, God granted him many favors. To the shock of his confreres, who thought he would never aspire to the priesthood, he became a priest. At seminary, it came time for him to take his final exams, the examiner asked him a question on the only Biblical text that he knew by heart and that he loved to expound upon. “His superiors set him to his studies, in the hope that he might learn enough to be ordained, but the effort seemed hopeless. With all his good intentions he learnt to read with the greatest difficulty, and, says his biographer, his writing was worse. He could never expound a Sunday Gospel in a way to satisfy his professors; one only text seemed to take hold of him, and on that he could always be eloquent; speaking from knowledge which was not found in books. It was a text of St. Luke (xi, 27): “Beatus venter qui te portavit.” Nevertheless he succeeded in being ordained, and the story of his success is one of those mysteries of grace, repeated in the lives of other saints, down to that of the Cure d’Ars in the last century, by which Christ Himself lets us see that for His priesthood He chooses “whom He will Himself,” no matter what regulations man may make.” Source: EWTN. Is that not true favor from the Lord? 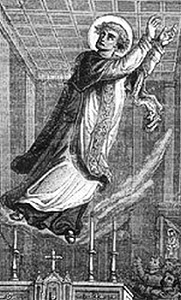 St Joseph of Cupertino went on to perform lots of miracles and could be seen levitating constantly. This is why he is known as the “flying monk”. So you see, those who need a little extra help because of an upcoming exam, have recource to St Jospeh of Cupertino, the patron saint of students. And now … the prayers. Burying a St Joseph Statue in the Ground - Superstitious? St. Joseph of Cupertino has helped us on numerous tests and given us great successes. Invoke him when in need! Thank you Jesus and to St. Joseph of Cupertino for hearing my prayers and interceding on behalf of my son. Praise to you Lord Jesus Christ. All glory is yours now and forever! Thank you so much for interceding for me so that my first quarter in college would go smoothly! I am forever grateful! I would like to thank the Almighty God for my success in all my exams. And to you st Joseph of Cupertino for interceding for me. These prayers really work and to God be the glory! He is forever faithful, failure is not my portion in Jesus’ name. I would like to thank my heavenly father for my success in all my exams for semester 1 and allowing me to go to semester 2. Lord Jesus I have four more semesters to go and I leave them all your hands. Again I say thank you for Lord for all that you do for me and my family. Lord Jesus take me and mold me lead the way that I may follow you without question. Amen!! 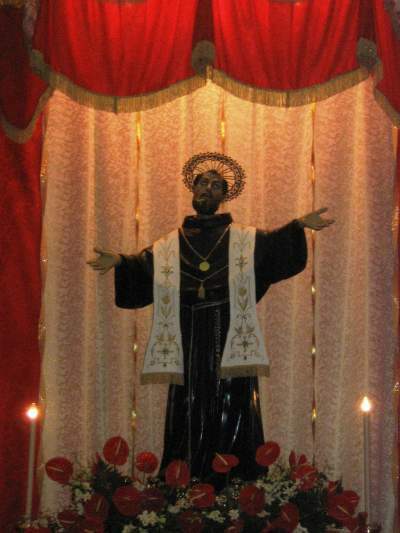 I am Grateful for St Joseph Cupertino also. Praying those prayers and trusting God to lead the way has gotten me great results. I passed all My Finals and on to the Next semester. A great thank you to St Joseph of Cupertino for his intercession in asssiting my son to pass his final oral examination for the sacrament of Confirmation. ? I want to thank you so much St. Joseph of Cupertino for hearing and answering my prayers. Thank you for your intercession on my behalf, I passed the test. I praise and honour you St. Joseph of Cupertino. Thank you for helping me clear my interview and get a job..
Help my daughter Ananya with success in her BMM exam at St Xaviers today. I pray for your intercession on her behalf to be successful in hee entrance today and get a seat in Xaviers. I promise to make you known through a newspaper ad for the same. O Great St. Joseph of Cupertino who while on earth did obtain from God the grace to be asked at your examination only the questions you knew, obtain for my daughter a like favour in the examinations for which she has prepared – pray for her success at the Symbiosis Law College and Jindal Law College. In return I promise to make you known and cause you to be invoked. waiting for my rexam result…st. joseph of Cupertino pls hear my prayers…thank u..
As I was preparing for my PMP exams, I was quite not settled given the pressures around me. I prayed and made intercessions through St. Joseph of Cupertino and after all the challenges that came my way, I went into the exam confident and to the glory of God and our blessed Mother Mary, I passed my exams. Thank you St. Joseph of Cupertino for the miracle. I thank you Saint Joseph for your intercession. Added my prayers to yours! Oh my saint Joseph of cupertino please help me pass my maths and science exams thins Monday to Wednesday. I will not forget u after this. Please help me get high grades that will satisfy me and my parents. Please help me to go to Secondary 2 Express stream and not get deprecated to Normal Academic stream. Thank u so much. I have prayed for my son Steve to pass his finals. Despite health problems and severe testing anxiety, I know it was with your intervention that he passed his finals last week. Thank you SO much. I now ask your help with his board exams. You faced such obstacles in your own life and I thank you for your inptirations now. Thank you for answered prayers, through Jesus and Mary. Amen. Please hear my prayer for my son to achieve a higher SAT score and reach his goal. I pray for help and inspiration. I promise to make you known and cause you to be involked. O Great St. Joseph of Cupertino who while on earth did obtain from God the grace to be asked at your examination only the questions you knew, obtain for my daughter jehna a like favour in the examinations for which she has prepared – pray for her success at the sociology paper. In return I promise to make you known and cause you to be invoked. Thank you, Saint Joseph of Cupertino for interceding on my behalf. I ask for success in my exams and he interceded for me. I passed the exams. I have had bad grades but immediately I remember Great St. Joseph of Cupertino I started praying it and I made better grades, now hanging in A-. I hope he will continue to intercede for me in my comprehensive final on Dec 4. So I can keep my grade. Thank You, Jesus and Joseph, of Cupertino for your hard prayers. I sincerely thank you for seeking blessings from God at the most difficult times of my son’s exams.If you had not interceded he may not have got through.I vouch for his intercession. Glory be to God in the highest. Dear St Joseph of Cupertino, pls intercede for my daughter May who has disabilities in studies, poor memory and lack of focusing skills she has a Math test on 7 Dec. Please sit to her, pray for her, and I believe all will go well for her. A very important placement test. Thank you. Could focus on the questions and receive a good outcome! Thank you,Thank you she passed her finals and now on to the next semester in January! I have told many people about you St. Joseph of Cupertino and continue to make you known and cause you to be invoked! Dear St Joseph of Cupertino, i had know about you since i was the university and you helped me a whole lot. Previous IELTS i took were done without invoking your intercession and the outcomes were not satisfactory. Only to be reminded about you a week to the IELTS i just took, what a blessing in a short while. I have within the last week done your novena prayers, i believe so much in your help that by the time this results would be released, i would have no reason not to make your name known worldwide. Thank you for interceding for me. Thank you, St Joseph of Cupertino. My daughter passed the test. Thank you??? Thank you Almighty God for my exam results. Also, thank you St Joseph of Cupertino for your intersession. I could not have achieved the result. Prayers really work. I kept saying this prayer to St. Joseph of Cupertino while preparing for my professional exams. I wrote my exams and one of the papers seemed extremely difficult. I thought i would fail that paper. The results came out and i passed all my papers including the difficult one. It was a miracle. Thank you St. Joseph of Cupertino for interceeding for me. I would like to thank St Joseph of Cupertino for helping my daughter pass her driving test (theory) 2 days ago. She had failed by 1 mark before and resat it. This time, after studying, through the intercession of St Joseph of Cupertino and Our Lady, Seat of Wisdom, God granted her marks above the mininum pass mark. O Great St. Joseph of Cupertino who while on earth did obtain from God the grace to be asked at your examination only the questions you knew, obtain for me a like favour in the IELTs examinations of 05 January 2019 for which I am preparing. I took the speaking module today 29 December 2018. I pray for my excellent success in all the 4 modules of Listening, Reading, Writing and Speaking and cause my results to come out in flying colors as follows (Listening – 9.0, Reading – 9.0, Speaking – 8.0 and Writing – 8.0). Thank you, Saint Joseph of Cupertino. I started saying your prayer a day or two before my GRE general test. I’m here to say thank you for your intercession, I was happy with the questions I was asked and got my highest marks so far in GRE. Thank you almighty God! St. Joseph of Cupertino, you helped me pass my exams when I had failed several times before. I thought it wasn’t possible to pass, but my belief in your prayer gave me the strength to try just one more time. I will forever be grateful to you and will continue to pray for your guidance. Amen. Thank you Almighty God for helping my daughter during her exams. She has just received her results and has done well. Thank you St. Joseph of Cupertino for your intercession. Amen. Thanks be to God. Thank you St. Joseph of Cupertino. I finished my CPA exams. Please pray for my father to succeed in his interview. Dear St Joseph of Cupertino, please pray that our daughter will be successful with her interview today Monday 21st January, for a promotion in her civil service career. Help her to excel in her written paper and verbal examination and be offered the post. Thank you. I want to use this medium to thank ST. Joseph of Cupertino for a Successful exam. I received my ielts result today and the scores are amazing. God is indeed great. I pray for the Successful completion of the main aim of the Examination in Jesus name I pray Amen. Thak you Jesus. Please saint Joseph of Cupertino intercede for me in my exams which will be due in June 2019 CPA .Without success I have not been able to pass my two papers which have really frustrated me so much which are my last papers .I promise to let other people know of your love for people with difficulties in their studies. Also take this opportunity to thank you in advance for the many people who have testified for your help . Thank you St. Joseph of Cupertino for your intercession. I passed the NCLEX nursing exam and I’m getting my license. St Joseph of Cupertino Please intercede for me to pass my series 24 exam on monday. I ask you for the wisdom, patience, knowledge and calmness to sit thru the exam and pass. I have put my faith in God and trust in his will. I will praise you and make sure everyone knows that you have helped me accomplish this goal! Thank you St. Joseph Cupertino for your intercession . My child excelled in her UIL events and has continued to do well in school. I sat two exams I was sure I was going to fail, but through this prayer i somehow managed to pass both. Thank you St Joseph of Cupertino I will forever be grateful. Thank Jesus for the grace and end result in my studies I desired. all credit goes to you but special thank you to Saint Joseph Cupertino for success in my test and all the other saints intercessory prayers from the Blessed Mother, Saint Joseph, Saint Jude, Saint Michael, Saint Gregory, Saint Rita, Saint Anthony, Saint Francis Xavier, Saint padre Pio, Saint Claire of Assisi, Saint Francis of Assisi, Saint John Paul II, Saint Therese, and Saint John 23. I would like to thank our heavenly Father and St. Joseph of Cupertino who watched over and assisted me with my first exam. I was able to pass it on the first try. I am truly grateful. I would like to thank our heavenly Father and St. Joseph of Cupertino AGAIN who watched over and assisted me with my second exam. I was able to pass it on the first try also. I am so truly grateful. Yes! Thanks be to God.